Hope to see some of you at this next Monday - S.L. It is a great honour for Heythrop College Jewish Society, together with Heythrop Student Union and UJS, to mark Holocaust Memorial Day by hosting Holocaust survivor and ex-resistance fighter Jack Kagan. Mr Kagan came from Novogrudek, a small town in Belorussia. He is the only member of the Bielski partisans in the UK. He will recount his amazing story of escape through a tunnel from a labour camp to join the Bielski brigade as a young teenager. 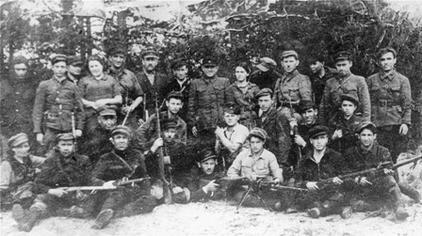 Jack along with 1,230 plus men, women and children lived and survived in the forest as a whole community who managed to create synagogues, bakeries and even an airstrip. This was used by the Soviet air force to fly in supplies and fly out the wounded. As part of his talk, he will be showing us a film made in 1931 showing his home town as it was before the war, when 50% of its inhabitants were Jewish. He is also the co-author of a book about life in the community of partisans, called “Surviving the Holocaust with the Russian Jewish Partisans.” It's available on Amazon, and Mr Kagan might be willing sign copies if you were to ask him. We strongly urge you to come to this talk; opportunities to hear first hand about experiences during the Holocaust are becoming increasingly rare, and it's important that our generation hears as many stories as possible so that it can pass them on to the generation after us who won't get the same opportunities. Or drop an email to jthropsoc@gmail.com. This event will be taking place in the Loyola Hall at 18:30 on Monday 28th January.